As soon as people started using maps to find their way around the world, the shortcomings became apparent. River waterways shifted, forests were frequently destroyed by fires, and nomadic settlements moved from one place to another, making it difficult to record objects on the map. Thus, the history of maps is also the ancient history of bug fixes and attempts to create the perfect product. Today we will see if through centuries people have managed to come closer to the canonical scheme of depicting the world. The above image shows an exact copy of the original piece of mammoth tusk found near the town of Pavlov in the Czech Republic. After many years of research, the pattern on the tusk was finally acknowledged to be the oldest known map. It is estimated to date back about 25,000-27,000 years. The tusk depicts river bends, ridges, ravines of friable loess slopes, rocky peaks and a hunters’ house. A map like this would have not lasted even for the people who made it. The image would need to be changed often, a new map to be created, or a fundamentally different means of finding one’s way around the area would need to be discovered. How to depict the image of an area if it is constantly transforming? Perhaps it is worth focusing on the unchanging objects – such as the stars. The North Star, a part of the Ursa Minor constellation, always points to the North and fluctuates only half a degree at night (due to precession, different stars were considered to be the North Star at different times). Knowing where the North Star is, it is easy to tell directions: when facing the North Star, east is to the right, west is to the left, and south is behind. The first constellations were identified about 16,000 years ago and were depicted in various Paleolithic cave drawings. However, the map feature of the night sky drawings was considered simply as a side effect. The Nebra sky disk (dating back to about 3,000 BCE), which depicts the sun, moon, and 32 stars, was presumably used for measuring the angle between the sunrise and sunset points at summer and winter solstices. 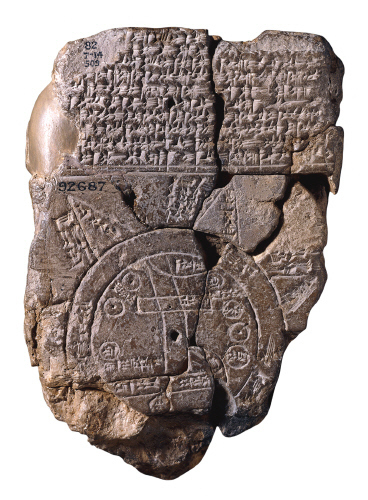 The first top view maps appeared more than 6,000 years ago. 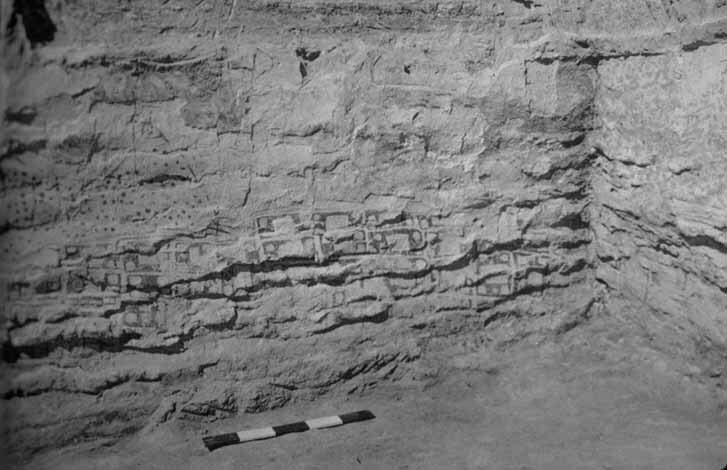 A mural in the ancient settlement of Çatal Hüyük is considered to be a detailed plan of the settlement. The streets of the settlement were not marked on the map — the borders of each house were probably denoted by the light lines. A modern reconstruction of the Çatal Hüyük map. The color orange presumably indicates an existing volcano. White rectangles depict flat-roof houses. Source. A number of later authors followed a similar scheme of visual representation of an area. Now, liteally all modern maps are top view. 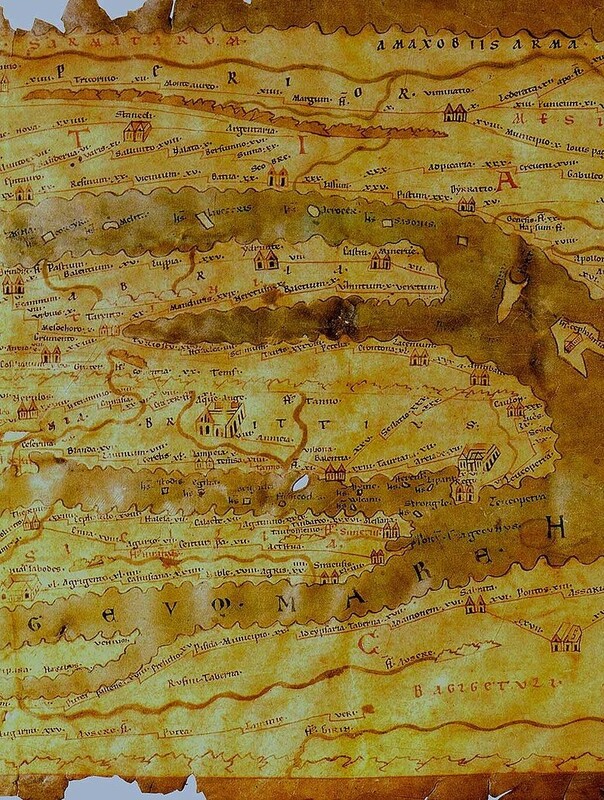 A fragment of the Turin papyrus map, the first known topographic map. Source. The first map that could be considered as large and detailed by today’s standards, was created around 1160 BCE. It showed the mountains to the East of the Nile. The dimensions of the reconstructed Turin papyrus map are 280 x 41 cm. The first map of the entire world known at the time (dating back to about 600 BCE). Source. Closer to our times, cartographers started mixing facts with politics and religion, which distorted the actual picture of the world. For example, the Babylonian map had no sign of Persians and Egyptians. However, mythological elements were highlighted, while the edge of the world based on religious beliefs was depicted as a ring of the worldwide ocean. Centuries later, similar issues were faced by the Greeks. The Ancient Greeks depicted the world as a flat disk surrounded by a constantly moving ocean. Naturally, the Greeks placed themselves at the center of the disk, with savages and monsters were placed along the edges. 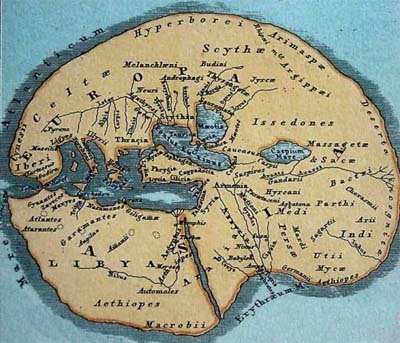 The Greeks, however, made a great contribution to cartography: map projections, meridians, and parallels. 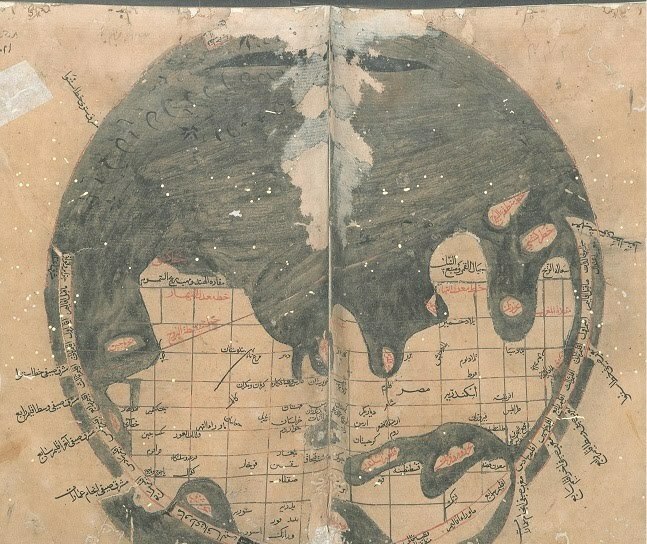 A 15th century reconstruction of Ptolemy’s map. Source. 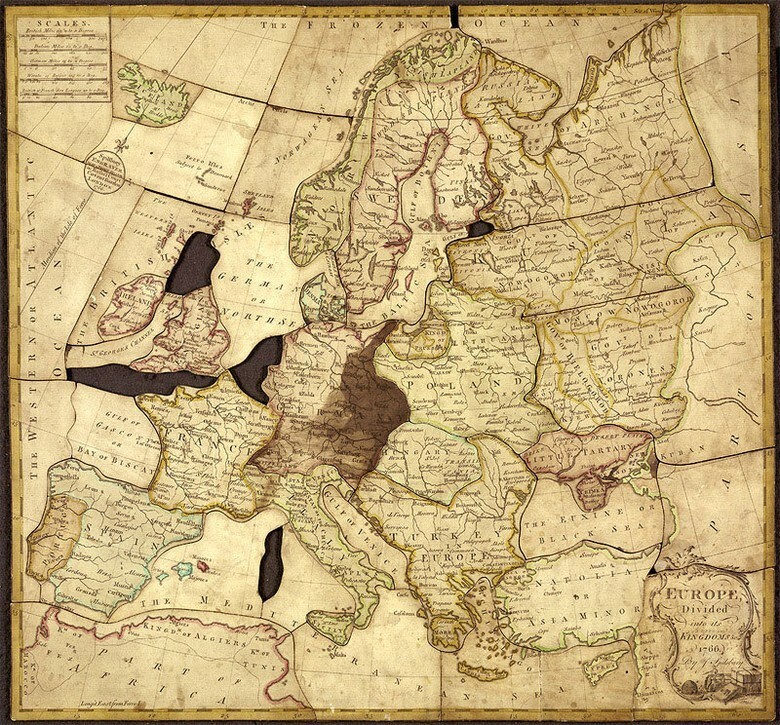 At the dawn of our era, especially during the Dark Ages, cartographic art was forsaken in Europe. 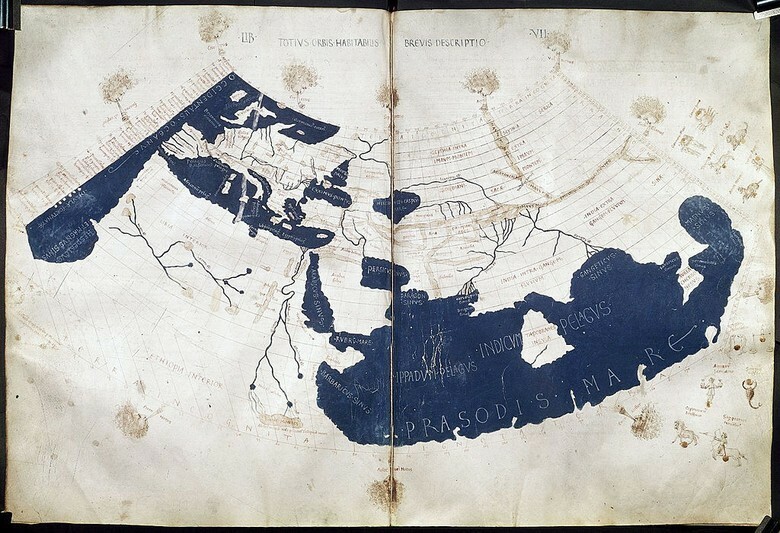 While maps became increasingly more informative and accurate in China and the Islamic world, Ptolemy’s map, created in the second century, remained the best map in Europe until the period of the great geographic discoveries. Ptolemy developed the conical and stereographic map projections, specified the latitude and longitude of each location to facilitate its search, and indicated scale and map symbols along with a legend. These are basic map features which are still being used today. 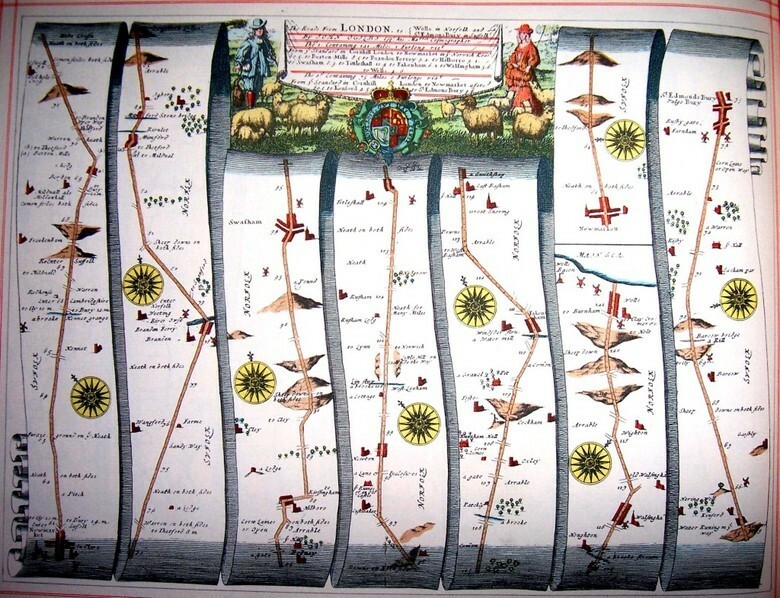 He also ascertained that North should be at the top of the map, and East – on the right. 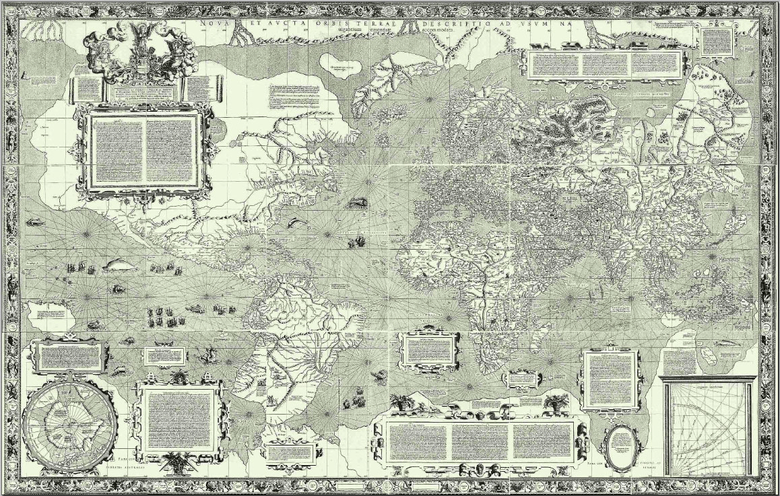 Despite numerous errors (for example, the Atlantic and Indian oceans were separated on the map), Ptolemy’s map remained popular for many centuries. It was the only map depicting inland African territories even in the early 19th century. The Qazvini map, 1340. Source. With many respects, the traditions set by Ptolemy were continued in the Arabic countries, where the instructions on compiling a rectangular world map with rectangular or cylindrical equidistant projections appeared as early as in the 10th century. Historian and geographer Hamdallah al-Mustafa al-Qazwini removed all the unnecessary geographical details from his maps, leaving only vertical and horizontal lines that intersected at right angles, as well as arcs. 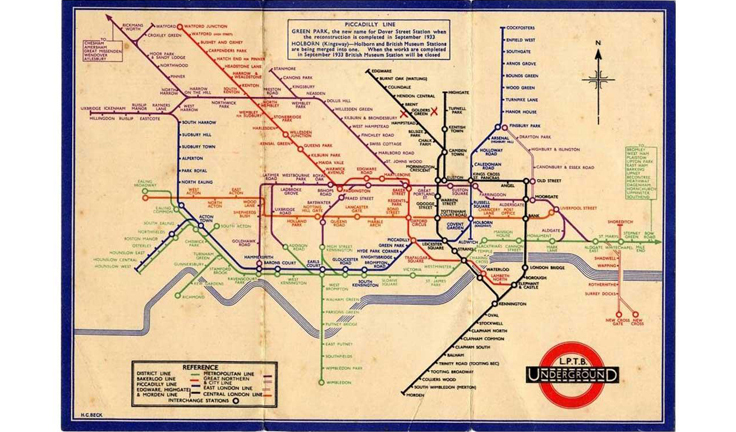 In 1931, guided by the same cartography principles, Harry Beck drew a diagram of the London underground, the London Underground Tube Map, which was not much different from the present-day map of the Moscow Metro. The Peutingeriana table (a fragment), created in the period between the 1st century BCE and the 5th century CE. The map is 6.75 m long and 0.34 m wide. The map shows 555 cities and about 3,500 sites. Source. In the Roman Empire, it was customary to supplement maps with a lot of additional information. The maps did not show the landscape, and did not observe the laws of perspective and scaling. Roads were depicted only schematically. Nevertheless, a traveler could use the map to find information about stops along his route, the length of individual segments, and obstacles or noteworthy places (main cities, temples, etc.). Nearly two thousand years later, we still use maps not only to find the shortest path, but also to discover different objects. 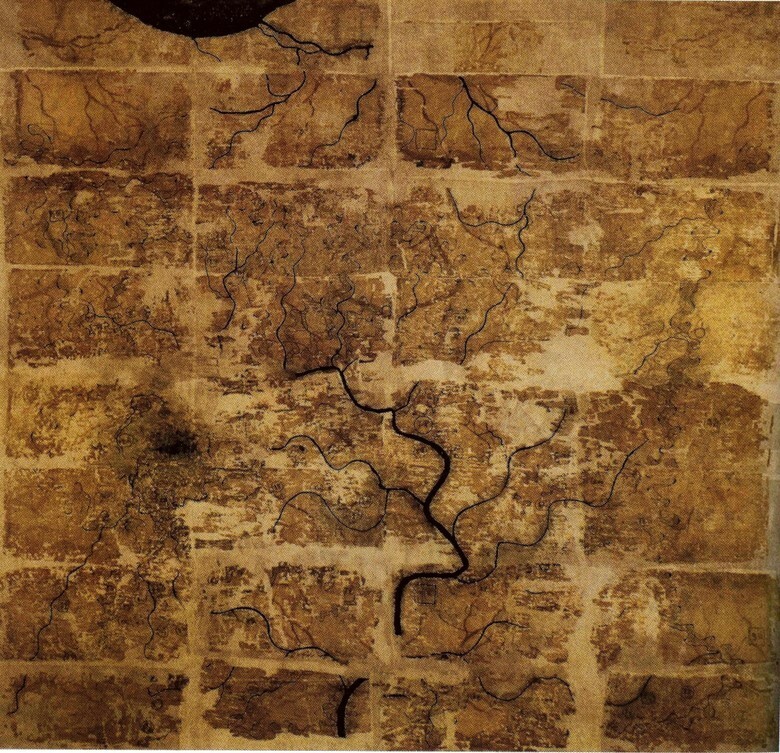 The Silk Map of the Han dynasty (around 200 BCE). Source. Somewhat earlier, the Chinese also decided that it was necessary to provide additional useful details on the maps. The Ancient maps of Chinese territories in the 4th century BCE had already included information on the economic structure of the administrative districts. The maps of the Han dynasty had the details of the local military facilities and population. 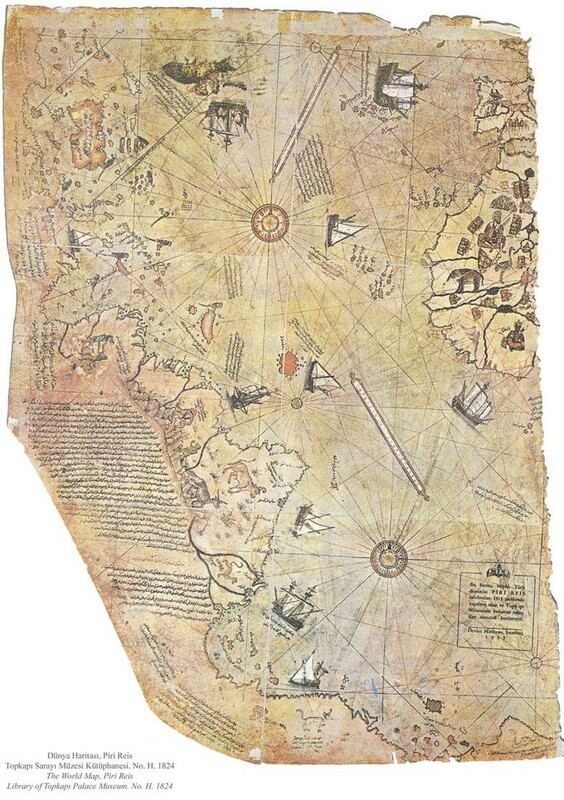 A restored fragment of the Piri Reis map (1513), considered the first authentic map of the modern world. The map, being a compilation of various sources, contains many riddles, including a representation of the territory associated with Antarctica, which was officially discovered only in 1820. However, the hypothetic Terra Australis (South Land) was drawn on maps before the Piri Reis map as well, based on assumptions alone. Source. The Bünting Clover Leaf Map, 1581. Source. The invention of the compass, telescope, sextant and other marine navigation devices, with the age of great geographic discoveries following shortly, truly disrupted the cartography. Real masterpieces were created, which were sometimes erroneous with regard to geographic objects, nevertheless magnificently executed with astonishing detail. In the 13th century, the so-called T and O maps (Orbis Terrarum or the circle of the lands) appeared. The T represented the Mediterranean, the Nile and the Don, dividing the three continents: Africa, Europe and Asia, and the O was the encircling ocean. Jerusalem was at the center of the map. 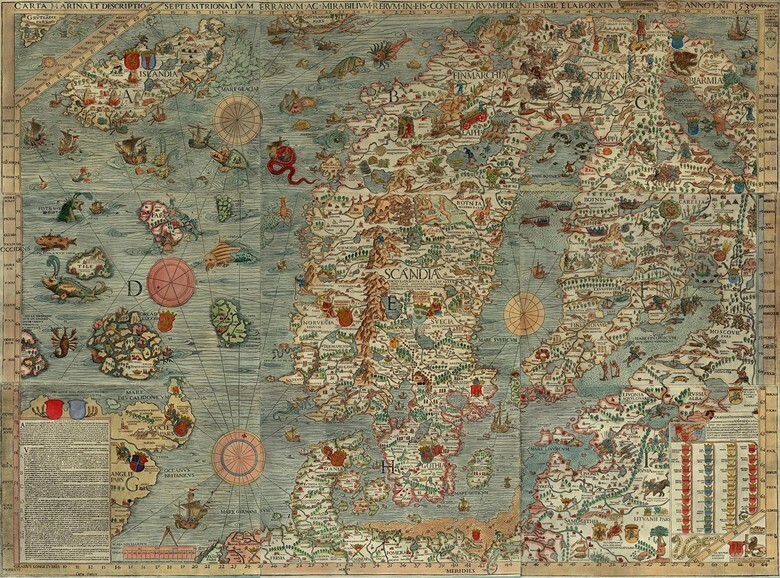 Blank spaces on such maps were traditionally filled with images of mythical beings. 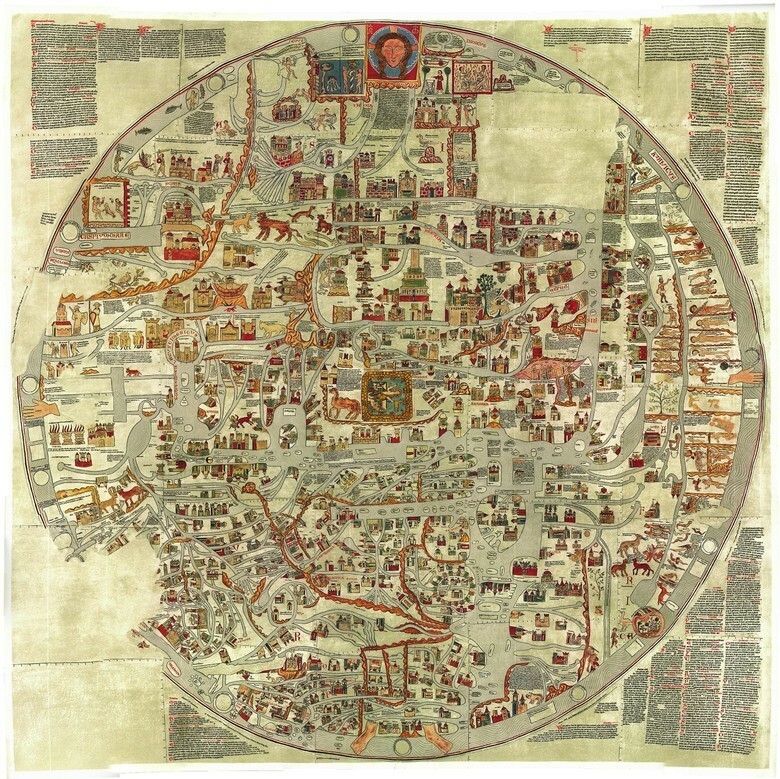 The largest T and O map drawn on 30 goat skins spanning 3.58 × 3.56 m is the Ebstorf Map. It was used not to travel, but to illustrate facts about the foundations of the universe, covering biblical and mythological events on par with real geographic objects. This is an example of Medieval infographics. 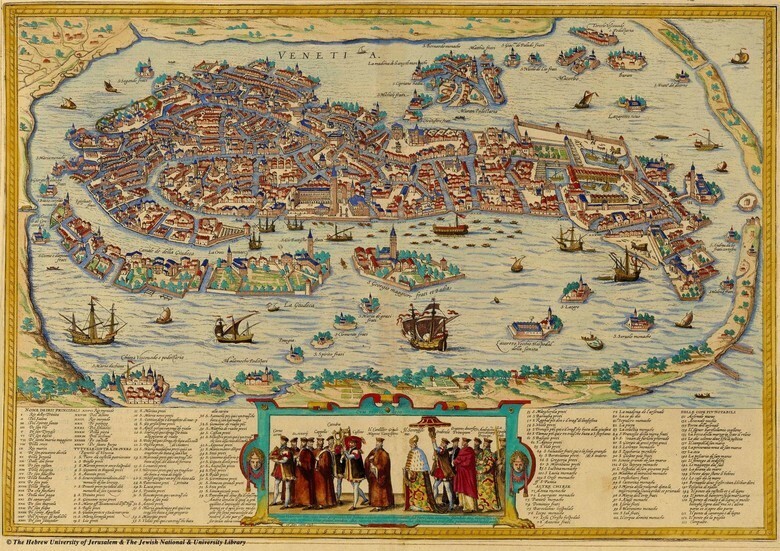 The 1539 Carta Marina is notable for the fact that it is possibly the first map where the images of eerie marine creatures became useful: they corresponded to flows, storm fronts, dangerous underwater rocks and high beds. In 1569, striving to map the world “properly” as it appears in reality, cartographer Gerardus Mercator developed a new projection using mathematical formulas. 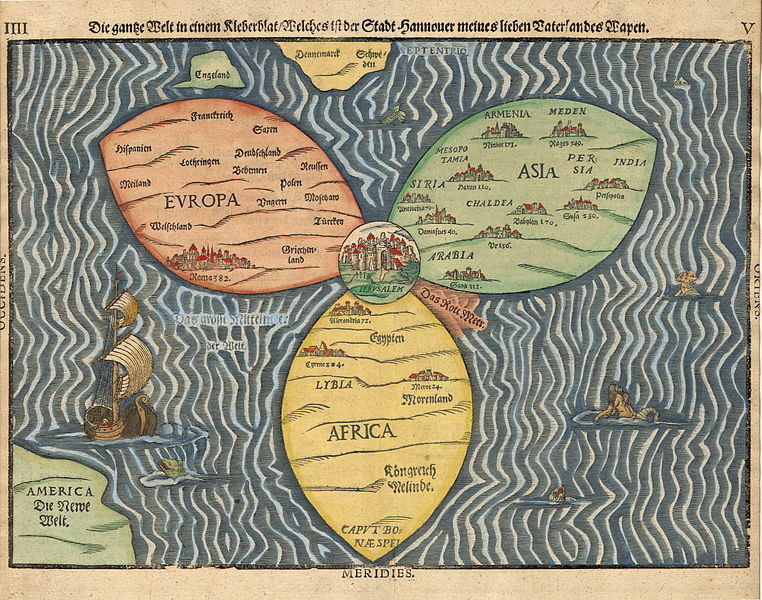 With Mercator’s projections, maps began to take on a modern appearance. 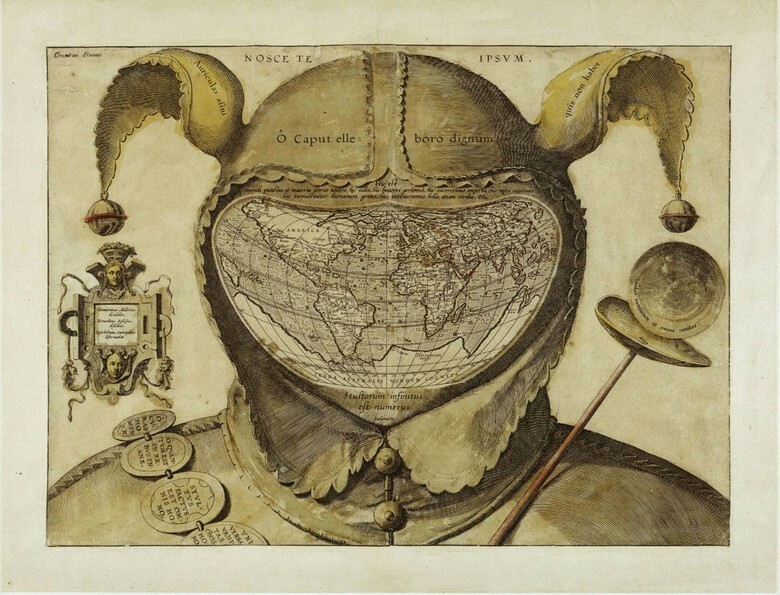 The 1611 Leo Belgicus is a map by Claes Janszoon Visscher. Leo Belgicus is Latin for Belgic Lion. 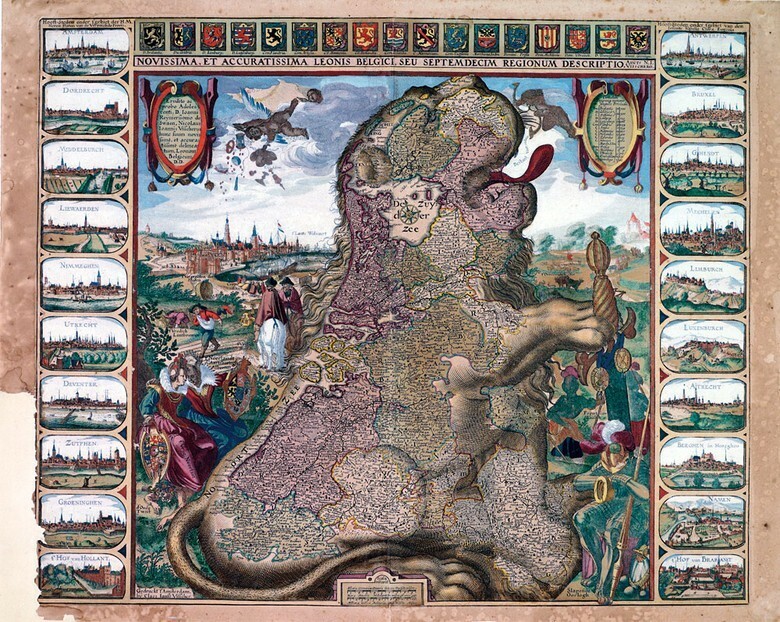 Starting from 1583, the Netherlands were often shown in the form of a lion. The map covers the period of reconciliation between Spain and the seven United Provinces (the Netherlands). In 1675 John Ogilby mapped strip-like roads, excluding all of the remaining environment and leaving only objects required for orientation. This ancient map has become a prototype of maps in modern vehicle GPSs. 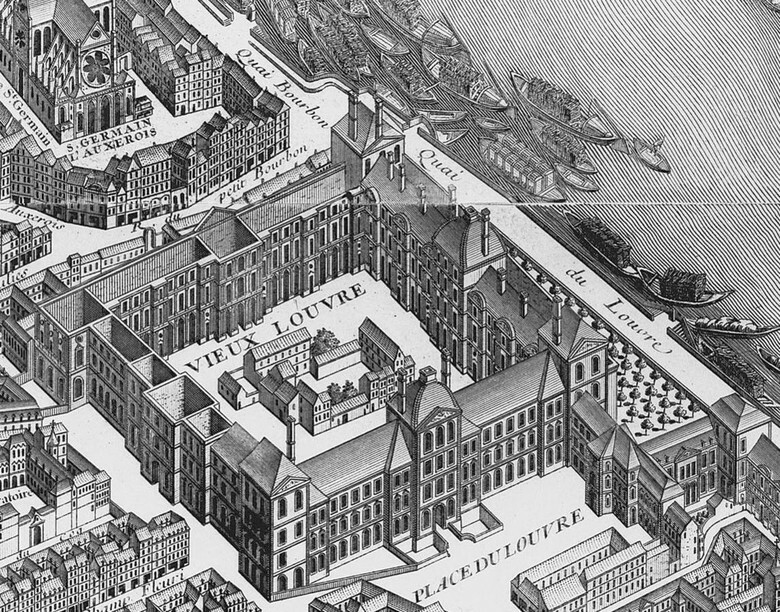 The French set the trend of axonometric projection in maps with a detailed plan of Paris, compiled in 1734-1736. The above image shows the Louvre. The entire plan of the city needs to be opened to appreciate the scope of this work. Almost three hundred years later, the Chinese accomplished a similar feature for Baidu search engine. Image taken from Europe divided into its kingdoms &c. by J. Spilsbury Originally published/produced in London, 1766. Held and digitised by the British Library, and uploaded to Flickr Commons. Have you heard of a scratch travel map which is meant to color or scratch the places visited to reveal the names and full geographical data? The first map of this kind was created in 1761 by John Spilsbury who invented the “dissected geographical map”. Each individual map fragment included some geographical information. By collecting the necessary pieces, one could explore the entire world as known at the time. By the 19th century, mapmakers tried to visually depict economic, social and political data. However, until the development of digital maps in the 21th century, additional data on maps was quickly becoming outdated. In the 20th century, maps became incredibly detailed due to aerial photography and, later, satellite images. However, soon after gaining popularity, satellite images were just as quickly reduced to a mere tool for diagram creation. They were practically useless on a city scale, and completely useless in forest areas. The solution came in the format of plans where people could manually map the objects that could not be photographed. Today, there are maps representing interests of people from the most diverse backgrounds. Greek researchers developed a system that converts images of traditional paper maps into three-dimensional city plans. With the virtual reality glove, a blind person can literally touch a map and read its data (or switch on a voice engine that names streets). Airbnb is experimenting with maps that feature culture- and context-based boundaries. In the map above, green denotes the traditional “tourist” places of residence, and red denotes houses covered by Airbnb. Any conventional map offers housing in the green area. However, a richer impression of real city life can be gained in the red area. Once the white blanks were completely filled, added-value maps quickly gained popularity. For example, the map of New York shows the most dangerous and the safest neighborhoods. For good reason, MAPS.ME offline maps based on the OpenStreetMap data, became the second project with an open source code in My.com. The essence of the OSM project (as well as MAPS.ME) is to provide every person in the world with a free map that can be used for any purpose. This was hardly imaginable throughout thousands of years of map history. Pocket maps became available only in the 19th century. Today, smartphones have replaced pocket maps, yet maps are not dependent on the internet connection. Accessibility is another feature setting OSM apart from the cartography of the past. Every person can make additions to the map as easily as editing a Wikipedia article. One of the most recent MAPS.ME updates gave users the opportunity to edit maps. Due of this, benches, fountains, and best places to take a picture can now easily be found. The advantage of open maps over commercial solutions is in their universality. The same plan of a locality with a different data set is used in many situations. With OSM, users can map forest paths and primers, food distribution points in the poorest regions, forest fires — basically anything! When comparing modern maps to maps of the past — and not only the Medieval ones, but also maps that are two thousand years old — one may easily conclude that maps have evolved into a useful information product. The design has become much simpler – however, maps are now less informative. Looking over the three-dimensional canvas from the Renaissance, dozens, if not hundreds of additional objects can be seen along one’s route. The smartphone offers a depiction of just the things that reflect the UX logic of the mapmakers: that is minimum information per area unit. A digital map does not need to amaze anyone with its design, for it is only an add-on over the search bar: one can look for ATMs, hotels, shortest paths, and nearest places of interest. Maps are no longer a guide for the world explorer, but a tool to save time. Excessive information only wastes people’s time. “National maps” resolve this issue somewhat by introducing filters, offering users the opportunity to see the city with the entire multitude of objects. Modern maps are not created by artists or designers, and not even by cartographers, but by programmers. This is the sign of the times: unless the map is adapted to any mobile device, no one will use it. Maps have ceased to be works of art. They are devoid of eerie monsters swallowing up ships, and look strikingly alike. However, compared to ancient maps, the modern ones have one essential advantage: they can be changed quickly. Before we know it, maps will be completely personalized. Some people will receive information allowing them to consider all the details and nuances, while others — only a brief concentrated fact about the locality. One interesting example of the trend towards “personalization” is the Galton OSM-based map showing places within real walking distance. 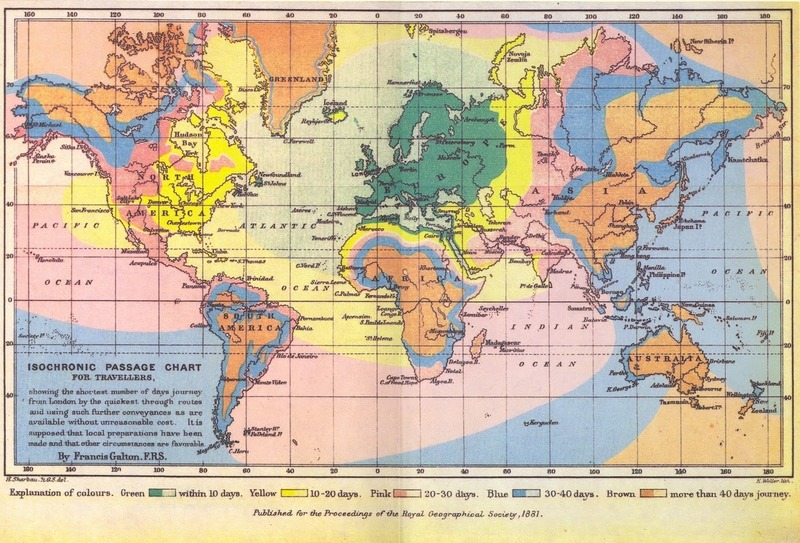 The map is named after Francis Galton, an English explorer and geographer, who in 1881 created the Isochronic passage chart indicating the number of days required to travel from Great Britain to various places. A map fragment of “quiet” New York neighborhoods constructed on the basis of noise complaint analysis. What is this map for? Besides the obvious (where you can go within a certain time, provided you cannot walk on water or go through walls), one can calculate the rating of a place considering many parameters of objects situated within walking distance. Sooner or later, a single map of the world will cease to exist because the world will be filled with different information for different groups of people. The metamorphoses will not affect the basic concepts, conventional state boundaries or distances between cities, yet drivers, pedestrians, bikers and bar lovers will be able to find just what interests them in the geography of their environment. And the map will once again become a source of discoveries.